Pietro Ruffo (b.1978 Rome, Italy) makes mixedmedia work that reflects his social and moral concerns, and stance on specific ethical issues. Working in drawing, watercolour and sculpture, he creates intricate and meticulously-detailed objects which demand an intense manual working process. Questions concerning the nature of freedom are at the core of Italian artist Pietro Ruffo’s practice, as his works explore a wide range of social, moral and political issues. 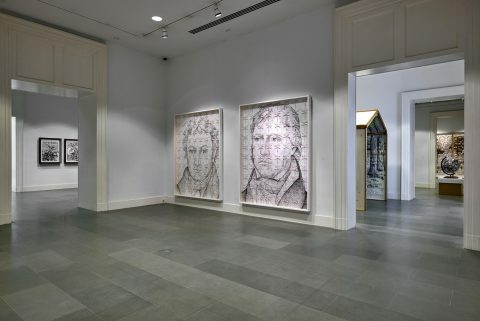 For his debut exhibition with Blain|Southern (2012) he created a series of large-scale, intricately-worked drawings which examined the concept of liberty. Studying a number of American moral and political philosophers, Ruffo’s aim was to investigate ideological structures of thought that have influenced politicians in the United States from the 1970s onwards. Concentrating on John Rawls’ and Robert Nozick’s theories relating to freedom, the artist considered the idea of true freedom and the role that individual liberty might play within this. In his seminal work, Anarchy, State and Utopia (1974), Nozick attacks Rawls’ Theory of Justice (1971), in which Rawls proposes a system where the fair distribution of resources will ultimately benefit the disadvantaged sections of society. Nozick conversely argues in favour of a minimalist state, and ultimately questions whether it is ever fair to take something from one individual and give it to another. In order to highlight and further consider Nozick’s arguments, Ruffo has focused on a section of the text entitled ‘The Tale of the Slave’. The ‘Tale’ comprises nine passages that propose various cases of slavery, through which Nozick essentially contends that taxation is itself a form of enslavement, and that subsequently modern democratic states are fundamentally slave states. 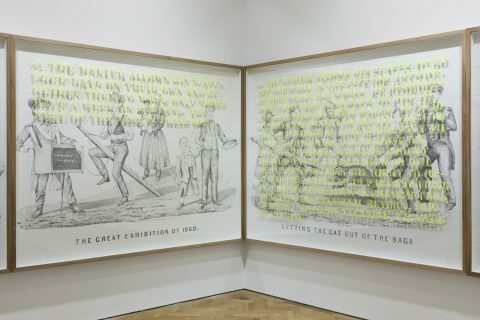 In response to Nozick’s ‘Tale’, and due to the implicit connection that Ruffo sees between the politics of the mid-19th century and those of today, he created nine finely-detailed pencil drawings appropriated from the work of 19th century satirical draftsmen. Politicians who held conflicting policies and beliefs are depicted in caricature, assuming numerous comical postures. In direct dialogue with these images, Nozick’s nine sentences appear upon the drawings, delicately cut out, raised above the surface of the work and secured with pins, creating a subtle optical illusion as the drawings oscillate between two and three dimensions. Ruffo’s engagement with Nozick’s text forms part of his ongoing investigation into a wide range of social, moral and political debates. Since 2008, his work has focused on concepts of freedom, as seen in his Isaiah Berlin (2009-10) series, in which large portraits of the liberal scholar and philosopher were drawn over old maps. His extended and ongoing series of works, Flags, engage the theme of parasitism as well as exploring ideas of contemporary colonialism, tracing the cultural and military influence of some of the world's largest imperial powers. The artist’s research is scholastic and yet his notes are graphic, rather than written. He discusses his work not as a finished product, but as process-based research; open-ended and in continuous development.In 2009 he won the Premio Cairo Award (Italy) and in 2010 he was awarded the New York Prize, bestowed by the Italian Ministry of Foreign Affairs. His artist residencies have included working at The International Studio and Curatorial Program, ISCP Centre, New York (2010); the Nirox Foundation, in Johannesburg (2012) and most recently at The Fountainhead Residency, Miami (2013). 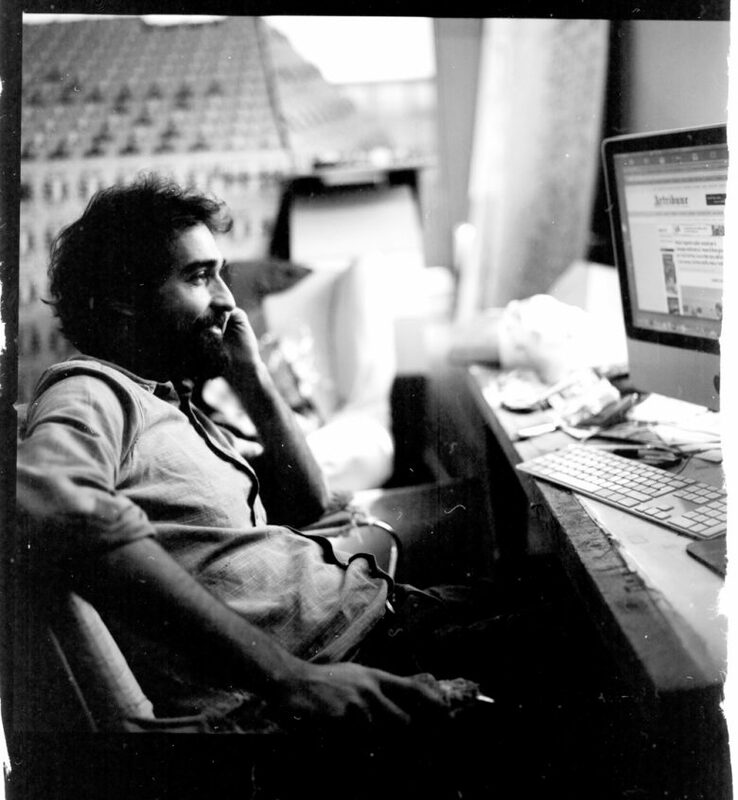 Recent solo exhibitions include: Pietro Ruffo: A Ilusão Perfeita,Lisbon Italian Cultural Institute, PT (2018); Pietro Ruffo, Breve storia del resto del mondo, Fondazione Puglisi Cosentino, Catania, IT (2016); Terra Incognita, Italian Embassy Cultural Centre & Basu Foundation For The Arts, New Delhi, IN (2015); SPAD SVII, Galleria Nazionale d'Arte Moderna, Rome, IT (2014); Pietro Ruffo: Liberty House, Siena, Chiesa Monti, IT (2014); Pietro Ruffo, SOYEZ RÉALISTE. DEMANDEZ L'IMPOSSIBLE, Galleria Franca Mancini, Pesaro, IT (2014), Irhal,Irhal, Galleria Lorcan O’Neill, Rome, IT (2012); The Political Gymnasium, Blain|Southern London, UK (2012); Complex Instant, All-Russian Museum of Decorative Applied and Folk Art, part of the special projects of the fourth biennale of Moscow, RU (2011); Negative Liberty, Caffè Florian, Venice, IT (2011); L’enfer c’est les autres, Galerie di Meo, Paris, FR (2011); I sei traditori della libertà, Fondazione Pastificio Cerere, Rome, IT (2010); Pietro Ruffo, Museo Arte Contemporanea di Ravenna, IT (2009); Confini, Museo archeologico Rossi, Ventimiglia, IT (2008) and Flag, Galleria AKA, Rome, IT (2005). Ruffo has also worked on a number of public projects, including a sculptural proposal for Ground Zero in New York. Recent group exhibitions include: Gradi di Libertà, Museo d’Arte Moderna di Bologna MAMbo, Bologna, IT (2015); Imago Mundi: Map of the New Art Exhibition of the Luciano Benetton Collection, Fondazione Giorgio Cini, San Giorgio Maggiore Island, Venice, IT (2015); Nero su Bianco, American Academy in Rome, IT (2015); Contemporanea Mente, via delle Belle Arti 131, Rome, IT (2014); Incidents of Phenomena | India-Italy-Myanmar, Spazio Cerere, Rome, IT (2014); Making History, Colombo Art Biennale, Colombo, LK (2014); Extra Large, MACRO (Museo D’Arte Contemporanea Roma), Rome, IT (2013); Italian Genius Now. Home sweet home, KAOSHIUNG MUSEUM OF FINE ARTS, Taiwan, TW (2011); Amor Parvi or the love of the small, Kunstverein-Langenhagen, DE (2010); SLASH, paper under the knife, MAD Museum of Art and Design, New York, US (2009); Apocalittici e Integrati, MAXXI, Museum of XXI Century Art, Rome, IT (2008); Notte della Ricerca, Istituto Nazionale di Fisica Nucleare, Frascati, Rome, IT (2006) and Fragments of time, yellow bird gallery, New York, US (2005). Ruffo’s work is in several public and private collections, including Deutsche Bank Foundation, New York, IL as well as the Museo d’arte moderna di Bologna (MAMbo) in Bologna and the MAXXI Museum in Rome, Italy.